MAYURBHANJ DISTRICT, India, Sep 26 2018 (IPS) - Kanaklata Raula from Kaptipada village in India’s Mayurbhanj District is on duty 24×7. The 52-year-old community health worker from Odisha state rides a bicycle for hours each day, visiting community members who need nutrition and reproductive healthcare. 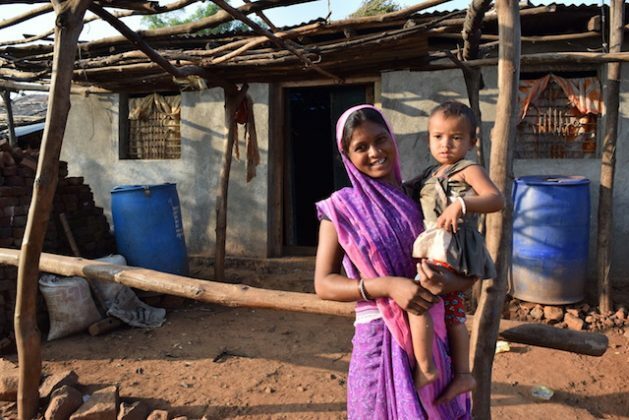 Raula’s main job is to ensure that the women and young children in her community are using the integrated free basic healthcare and nutrition services at the government-run community health and nutrition centre, locally known as Anganwadi. “Technology alone is not enough, we need to also reach the unreached population like the migrants who are too poor to afford a nutritious meal.” -- Laila Garda, the director of the KEM Hospital Research Centre in Pune city. Raula monitors the health of all children under the age of six, checks their weight and their growth, ensures they are immunised and advises their mothers and other pregnant and nursing women on basic healthcare and nutrition. She then encourages them to regularly visit the Anganwadi. But most important of all her duties, Raula is the record keeper of the community and notes, through numbers and statistics, the health of her patients. She then submits regular reports on the health of the community to the government. “I am in charge of five villages. There are 300 families and more than 80 percent of them are poor tribal people. Without Anganwadi they will not be able to get proper nutrition for their children or necessary health supplements for themselves,” Raula, who received the best Anganwadi worker award in July by Plan India, the Indian arm of Plan International, tells IPS. Life has gotten a little easier for Raula as the ministry of women and child development has decided to provide Anganwadi workers with smartphones or tablets with software especially designed to make their record-keeping and reporting easier. India currently has the fourth-highest number of stunted people in the workforce in the world. Of these, 66 percent of stunting is a result of childhood malnutrition, says a new World Bank report. The recent National Family Health Survey 2015-2016 shows that while there is a declining trend in child stunting, the levels remain high at 38.4 percent in 2015/2016. The survey noted increased levels of child wasting (where one’s weight is too low for their height); from 19.8 percent in 2005/2006 to 21 percent in 2015/2016. The country also has high levels of anaemia among children–58.4 percent of children under the age of six are anaemic. To curb the alarming rate of malnutrition and stunting, India launched a new nutrition drive last November called Partnerships and Opportunities to Strengthen and Harmonise Action for Nutrition (POSHAN). With a total budget of nine billion rupees (USD126 million), the campaign has an ambitious goal: to reduce stunting, under-nutrition, anaemia and low birth weights by about two to three percent per annum. a six-tier monitoring dashboard for desktops. But how will smartphones be used by the Anganwadi workers while in the field? Pramila Rani Brahma, the social welfare minister for Assam state, in north eastern India, explains that the phones will be loaded with software called the Common Application System or CAS, which was specially built for the POSHAN campaign and developed in collaboration with the Bill and Melinda Gates Foundation. The Anganwadi workers will use the software to enter the details of their patients, including the number of children they see, their health updates, weight etc., and will send this report to headquarters. Data on service delivery and its impact on nutrition outcomes will also be collected. The desktop monitoring system will be used to monitor the delivery of services to children, pregnant women and lactating mothers. It will analyse the ground data and map the weight efficiency, height and nutrition status of children under five years. “There are a total 11 registers which I have to regularly maintain. It [usually] takes many hours. I think it will save me a lot of time, which I can spend on serving the community better. I think it will also help send the information much more quickly to the higher officials,” Raula tells IPS. According to Brahma, the 61,000-strong Anganwadi workers in Assam state have been struggling to submit their daily reports and even demanded computers or laptops. There are currently nearly 1.3 million Anganwadi workers across India – all of whom will receive a simple, android data-enabled smartphone, according to the government. The phones will be distributed by the respective state governments, while the federal government and its ministry of women and child development will provide the funds. “I was informed that, there are provisions to provide smartphones to the Anganwadi workers and several other states have already taken this initiative. We will provide the smartphones to the Anganwadi workers within a short period of time,” Brahma said to a group of journalists – which included IPS – at a state-organised workshop on nutrition in Guwahati, Assam. The IT-enabled nutrition campaign has already reaped some results, when it was first rolled out in June. “We have given over 50,000 cellphones to Anganwadi workers through which they give us daily reports on how many children were provided food, how many were weighed, etc,” Gandhi said at press conference in New Delhi. “Until now, we have identified 12,000 children (as severely underweight) and we are following up on their status with the district officials,” she said. Besides collecting numbers, Anganwadi workers are also using the smartphones for surveying houses in their neighbourhoods and even sending photos of children eating a hot cooked meal at the Anganwadi. However, despite the new campaign, the road ahead for India to become malnutrition-neutral remains a difficult one. One of the main reasons for this is that the country still has a huge population that continues to face acute hunger. According to the Food and Agriculture Organisation of the United Nation’s report on the State of Food Security and Nutrition in the World, 2018, some 159 million of the country’s 1.3 billion people are undernourished. The Barilla Centre for Food and Nutrition’s Food Sustainability Index (FSI) 2017 ranks 34 countries across three pillars: sustainable agriculture; nutritional challenges; and food loss and waste. India ranks close to bottom on the index at 33. According to the index India ranks 32 in the world in food sustainability and human development. The centre will be hosting an international forum on food and nutrition this week as a side event to the United Nations General Assembly in New York on Friday Sept. 28. One of the topics to be discussed is food and migration. Kavita, a 22 year old domestic worker in Hyderabad’s Uppal neighbourhood, presents a perfect example of this. She is a migrant labourer from Mahbubnagar—a rural district some 150 km away from Hyderabad—and despite labouring for nearly 12 hours each day, she is unable to afford a nutritious meal for her and her 18-month old daughter. Every day Kavita cooks a simple meal of rice and tomato chutney for her and her child. Both the mother and daughter appear underweight and malnourished with a yellowish tinge to their hair and dark circles under their eyes. But the mother says that she has no time to visit an Anganwadi. “I start working at 5 am and finish only at 4 pm. I have to work seven days a week. If I take one holiday, my employers will fire me. I heard that at the Anganwadi they give dhal, curry and even eggs to children. But I can’t afford to leave work and take my child there,” she tells IPS. There are millions of poor migrants and floating workers like Kavita across urban India who are not aware of the government facilities or the POSHAN campaign and continue to be left out of these initiatives. According to the U.N. Educational, Scientific and Cultural Organization, there were 326 million internal migrants in the country as of 2007/2008. Unless this huge population is covered, it will be difficult to achieve the targets of the POSHAN campaign, says Laila Garda, the director of the KEM Hospital Research Centre in Pune city, Maharashtra. “Technology alone is not enough, we need to also reach the unreached population like the migrants who are too poor to afford a nutritious meal,” Garda, who has been working in community health for nearly two decades, tells IPS. Chuna Ram, a community reporter and nutrition activist in Barmer, Rajastahan—one of the states in the country with the highest rate of malnutrition—says that government action must go beyond the rhetoric. In Rajasthan, he says, the government has talked of providing smartphones to the Anganwadi workers, but it has not happened yet. “The general election is going to take place in 2019, so the government is making a lot of promises to woo the voters. But how much of these promises will actually be kept will decide how far the situation will change,” he tells IPS.